Sen. Tammy Baldwin (D., Wisc.) is slated to appear at a Hamptons fundraiser this weekend hosted by a corporate executive despite the first-term senator decrying top corporate personnel for actions such as stock buybacks. Baldwin, who is facing Republican Leah Vukmir this November, on Saturday night will attend a "Cocktails and Conversations" event in East Hampton with tickets going for up to $2,700. Baldwin is slated to appear at a brunch on Sunday at the home of Lisa Rosenblum, a government affairs executive for communications and media company Altice USA, who assists with the company's legislative, regulatory, and public policy initiatives. Rosenblum, a major Democratic donor, contributed $60,000 for Hillary Clinton's victory fund during the 2016 elections. Sen. Kirsten Gillibrand (D., N.Y.) will attend the Sunday event alongside Baldwin despite spending much of July lambasting the "toxic influence" of money in politics, the Daily Caller reported. Last year, Rosenblum held a fundraiser at her home for another likely Democratic presidential candidate, Sen. Kamala Harris (Calif.). Baldwin, one of the more liberal politicians in the Senate, will attend the fundraiser with Rosenblum after chastising corporations for actions such as stock buybacks, an alternative form of returning money to shareholders, a practice Baldwin has said is "wrong" and leads to "wealth inequality." Baldwin co-sponsored an amendment in March with Sen. Chuck Schumer to "rein in" the buybacks. "It's clear to me that the poor management decisions made by self-interested executives who are seeking short-term profits are driving wealth inequality and wage stagnation in our country," Baldwin said of the practice. "This amendment requires the SEC to do what I have been asking for years—provide stronger oversight of corporate stock buybacks." Weeks after co-sponsoring the amendment with Schumer, Baldwin sponsored legislation alongside Sen. Elizabeth Warren (D., Mass.) to outright ban "all open-market stock repurchases." However, despite Baldwin's push against the practice, the first-term senator has accepted $86,000 from at least 28 corporate political action committees who participate in stock buybacks, the Washington Free Beacon previously reported. Unlike a number of Democrats who are considered potential 2020 presidential candidates, Baldwin has not promised to reject donations from corporate PACs despite receiving the endorsement of End Citizens United, which pushes Democratic politicians not to receive donations from such committees. "Two-faced Tammy Baldwin says she's against special-interest money, but her campaign is clearly funded by liberal special interest groups," said Vukmir campaign manager Jess Ward. 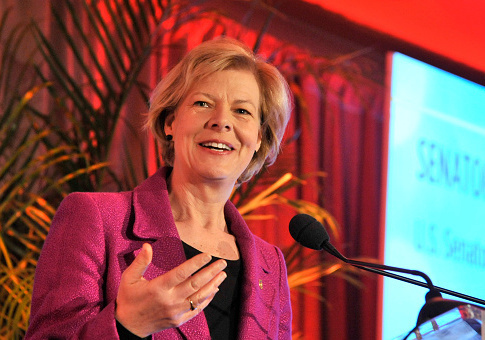 "Wisconsinites know that, unless you're a liberal East Coast elite, Tammy Baldwin has never been in your corner." Baldwin's campaign did not respond to a request for comment on the fundraiser. UPDATE 3:40 P.M.: This post has been updated with comment from Leah Vukmir's campaign. This entry was posted in Politics and tagged 2018 Election, Democrats, Tammy Baldwin. Bookmark the permalink.